Darrell E. North, 70, of Stamford, passed away Tuesday, February 5, 2019 in Abilene. Funeral services will be held 10:00 a.m. Saturday, February 9, 2019 at Trinity Church with Dr. Robert Wingrove officiating. Interment will follow with military honors in Bethel Funston Cemetery under the direction of Kinney-Underwood Funeral Home in Stamford. The family will receive visitors from 6-7 p.m. Friday, February 8, 2019 at the funeral home. Darrell was born July 6, 1948 in Columbus, Ohio, the son of the late Ernest and Shirley (Spellman) North. 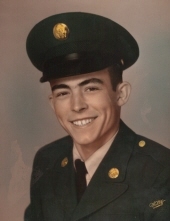 He served in the United States Army and was a Vietnam Veteran. He married Mary Ann Gothard on August 24, 1967 in Paris, Virginia. After retiring from the Army, he moved to Jones County in 1984. Darrell obtained his Associates degree in Criminal Justice from Western Texas College and served as the Jones County Constable for 24 years. Darrell enjoyed fishing, riding his golf cart around and talking to everyone he came in contact with and liked listening to old country music. He was an active member of the VFW Post 9179 in Lueders, Texas. Darrell was a Baptist. Darrell was preceded in death by his parents; an uncle and aunt, Robert and Lela Wingrove; and two grandchildren, Chase North and September Gould. Loving family surviving Darrell are his wife, Mary Ann North of Stamford; son, Bill North and wife Cheryl of Stamford; daughters, Starr Baumbach and husband Billy of Haskell, Dove North-Gould and husband Shawn of San Angelo; seven grandchildren, Tenelle North-Newton of Bossier City, LA, Nea North of Long Beach, CA, Ryan Baumbach, Dakota Baumbach, both of Haskell, Shelby Stone of Stamford, Dominic Gould, Natalie Gould, both of San Angelo; great grandchildren, Madalyn Baumbach, McKenna Baumbach, both of Haskell, Ella Newton of Bossier City, LA; sisters and brothers, Judy Glancey, Randy North, Charles North, Darla West, Janiey Beach, Sheala Thomas; and numerous nieces, nephews and cousins. The family would like to say thank you to all who shared their love and prayers during this time. To send flowers or a remembrance gift to the family of Darrell E North, please visit our Tribute Store. "Email Address" would like to share the life celebration of Darrell E North. Click on the "link" to go to share a favorite memory or leave a condolence message for the family.